There are many things you can do to help ensure the safety of you, your family and your home in the event of a major earthquake. The most important is to take steps before any emergency by identifying potential risks, taking the appropriate actions to minimize those risks, and establishing plans to assure that you are prepared - just in case. 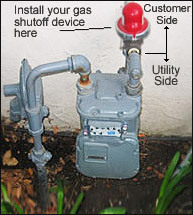 Emergency gas shut off valves are one way of protecting your home. There are three types of gas shutoff devices: manual shutoff valves, earthquake automatic shutoff valves and excess flow automatic gas shutoff valves. The "California Valve" is a horizontal earthquake actuated gas shut valve. It senses shaking in a residential building above a design level and automatically shuts off the gas. It is activated only in cases where shaking may be sufficient to cause damage to the gas pipe system. The valve is available in sizes to meet all residential applications. Some cities and counties have regulations that require the installation of automatic gas shutoff devices, which may include excess flow gas shutoff valves and/or earthquake actuated gas shutoff valves. Regulations vary, but generally apply to new building construction, or significant alterations or additions to existing buildings. Check with your local city or county agency to see if regulations apply in your area. Safety+PLUS Meter Excess Flow Valve protects from fire and explosion when pipes rupture. This type of device is activated in cases when excess gas flows downstream of the device, as in a gas leak. These units can be installed at the meter or at gas appliances. Earthquake Shutoff Valves and Excess Flow Valves are certified by the State of California. These devices should be installed by a properly licensed and qualified Contractor. For more information or to schedule an installation call or go to PG&E's website.